Airline information frequently changes. The information here are meant as pointers based on my own experience. It is recommended you verify this information when making arrangements also do your own research prior to booking. I’ve used various methods to book my ticket to China. When I’m not sure certain of return dates or think there may be a possibility my travel dates may change, I enlist the assistance of a travel agent. Due to their longstanding relationship with the airlines, agents have been able to alter my travel dates more easily than I can myself and often waive hefty change fees. If my plans are more straightforward I’ve used online booking sites as their fares are often the lowest. Even then, I always check in with my travel agent. With all the options available, it is highly recommended you do your own thorough research before making a final decision. When taking a long-haul flight, I always consider several factors when choosing a carrier including total flight time, frequent flyer programs and the feedback of fellow travelers. 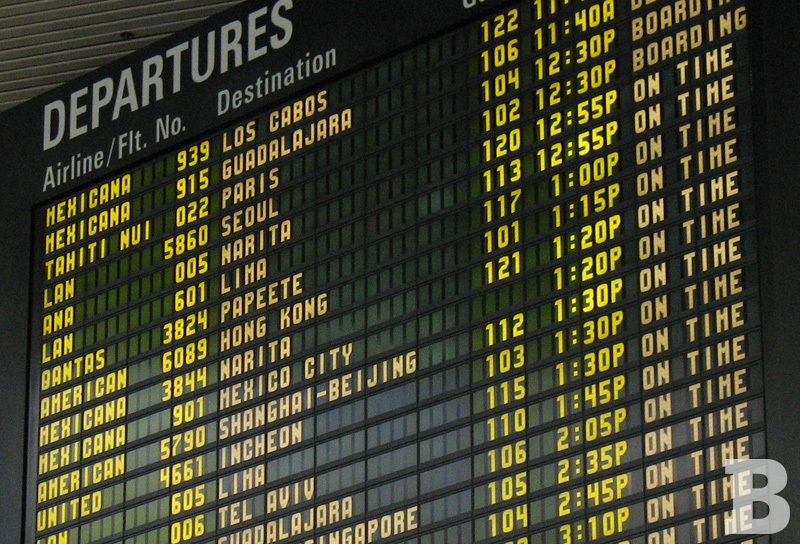 Overseas connections can vary from a couple to several hours. A shorter stop is nice when flying such a long distance, giving you a chance to stretch your legs, peruse duty-free shops and use larger facilities to spruce up before continuing on to your final destination. There are a couple non-stop options when traveling from the West Coast but otherwise you’re likely to have to make a connection somewhere. If you have extra time, making plans in your connection city is a nice way to maximize your flight dollars. Over the years, I’ve added “mini trips” in Hawaii, Japan, Taipei and Hong Kong. These days, mileage programs are more important than ever. The gap between regular membership and elite status is getting bigger with perks like no baggage fees, priority check-in and security lines available to frequent flyers. Many carriers require you fly 25,000 miles within a year to earn elite status. And a trip to Asia can make a major dent. You can also think of it as half way to a free ticket as many airlines allow you to purchase domestic tickets for 25k during off-peak travel times. If earning miles is important to you, you should double-check your own program’s rules. Belonging to an airline alliance or having a mileage partner it doesn’t mean you’ll automatically earn miles when flying with partner airlines. For example, China Eastern Airlines has a direct flight between Los Angeles and Shanghai and their fares are usually among the lowest available. They also belong to the Oneworld airline alliance which would allow you to bank miles to your American Airlines account. But, you will only bank the AA miles if your flight has an AA flight number: marketing by American but operated by China Eastern; known as a code-share flight.. These are available through American Airlines directly and also through third-parties like Kayak.com. When I checked for this trip, CEA did not sell these seats to AA at a discount. So, my CE flight– with a CE flight number–was $900 via Kayak.com. This same flight with AA flight number was $3000 because CE doesn’t allow AA to sell the seats with a discounted rate. Note: Alliance agreements which include details on how travelers earn miles change. It is important to verify this information yourself before purchasing. From Los Angeles and San Francisco, Cathay Pacific has a layover in Hong Kong. This is great option if you’d like to include Hong Kong as a destination on your trip. The MTR (metro) runs right into the city making transportation to/from the airport both convenient and affordable. Cathay Pacific has long held a reputation as a quality carrier and I really enjoyed my experience. The flight attendants are very courteous and the planes are nicely equipped for long-haul flights with individual entertainment centers and power ports. The flights are also well planned with frequent meals/snacks and cabin lights on/off schedule. You’d be surprised at what a difference this last part makes– see my write-up on the very different United experience. China Eastern Airlines offers the only non-stop option to Shanghai from LAX. I like CEA and would have flown with them this year if I was able to earn AA miles– see above. The direct flight option is really nice if you’re concerned with total travel time. Similar to CP, the flight attendants are very courteous and the planes are nicely equipped for long-haul flights: individual entertainment centers, power ports. Cons: CE doesn’t have a sophisticated or easy-to-navigate website. Also, earning miles with mileage programs you may already belong to, e.g. American Airlines, is difficult. Air Canada had newer, cleaner airplanes and a great staff. The only downside is the additional travel time it takes to connect via Vancouver. Personal entertainment systems and individual power ports are available for each passenger. EVA Airlines connects through Taiwan. Similar to Cathay Pacific, this is a great option if you’d like to incorporate Taiwan into your trip. For all my flights to Taipei, EVA was my first choice. In addition to Economy, Business and First Class, EVA also offers the all-new Elite Class cabin (replacing the Economy Deluxe which was similar to United’s Economy Plus). The section has seats that give more legroom and seat width– regular business-class seating with a 38-inch seat pitch; larger 8.4” XGA high-resolution touch screens (Economy Deluxe were just 5.6”). If you can’t spring for business seats and are willing to spend more than the average economy fare, this sounds like a fabulous option. I had heard tons about this award-winning airline and couldn’t wait to try it for myself last year. The flight attendants were courteous and the on-demand entertainment was nice. But, the lack of power ports and long layover in Seoul would lead me to reconsider this option again in the future. However, similar to all the other flights with layovers, this is a great option if you plan to incorporate Korea into your travel plans. United Airlines has been the least impressive of the bunch. While there were a few exceptions, I found most of the flight attendants to have lower than average performance and customer service skills when compared to their overseas competitors, e.g. JAL, Cathay Pacific. Sour attitudes ran rampant. Hospitality does not seem to be emphasized during training. If you fly domestic often, this should come as no surprise. My previous transpacific travel experiences had me expecting more and left me truly disappointed. My biggest gripe is the lack of personal entertainment systems AND power outlets. I was absolutely stunned. On a 12-hour flight this was totally unheard of and the option of not being able to power my laptop is a dealbreaker. On the outbound flight the cabin lights were left on for most of the 12-hour journey leading lots of people to congregate in the aisles and near the restrooms. On the up side, the availability of Economy Plus seating with extra legroom was a really nice option. It cost me $119 for each leg (SFO-PVG) bringing my total fare to almost $1500. This was about $400 more than other options I was considering and I really didn’t think the experience warranted the price. Bottom line: For me, I don’t think I would choose UA again. But if you value the extra legroom over all the other amenities, this may be a good option for you.